The settings for the telephone numbers entered in the FRITZ!Box cannot be edited or you cannot enter new telephone numbers. A maximum of 20 internet telephone numbers can be entered in the FRITZ!Box. If you already entered 20, then you cannot enter any additional internet telephone numbers. 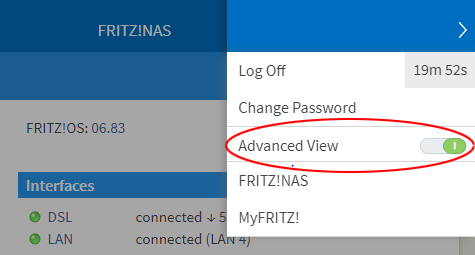 The advanced view is enabled when the on/off switch is green. .
With some cable providers, telephone numbers are automatically configured in the FRITZ!Box when the internet connection is configured. If your provider does this, you cannot change the settings for telephone numbers that were configured automatically or enter additional telephone numbers in the FRITZ!Box. Refer to your cable provider for information on entering and editing telephone numbers.